A new study published in the journal Pediatrics claims lullabies are more than soothing songs to lure baby to sleep. 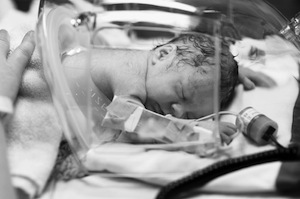 Premature infants treated in NICUs (neonatal intensive care units) showed improvements in health associated with lullabies. About 272 premature infants were included in the study. All infants were admitted in the NICU at one of 11 participating hospitals. All infants were near the 32 week gestation point or they were born with medical issues like sepsis or respiratory distress. The infants were split into three groups with each group associated with a different type of music. Whoosh and heartbeat sounds were matched to infant heart rate and breathing patterns using gato boxes and Remo ocean discs via certified music therapists. Lullabies were chosen by parents and sung to premature infants by parents and therapists. If parents did not have a specific lullaby preference, "Twinkle Twinkle Little Star" was chosen as a default song. Singing and sound interventions occurred three times per week for two weeks. Infants who listened to therapists or parents singing lullabies slept and fed better. Ocean discs improved quiet alert states and oxygen levels in the blood. Gato boxes or heartbeat sounds did not appear to have any effect on infants. Source: Joanne Loewy, DA, LCAT, MT-BCa, Kristen Stewart, MA, LCAT, MT-BC, SEPa, Ann-Marie Dassler, RN, MSN, FNP, IBCLCb, Aimee Telsey, MDb, and Peter Homel, PhDc. The Effects of Music Therapy on Vital Signs, Feeding, and Sleep in Premature Infants. Pediatrics peds.2012-1367d; published ahead of print April 15, 2013, doi:10.1542/peds.2012-1367d.